Son of Christos Sarfatis, renowned singer of the Greek National Opera. I was born in Athens. I trained as a painter and mosaic artist at the Athens School of Fine Arts under distinguished artists. (painting: Yannis Moralis, mosaic: Elli Voila). As a student I was awarded a scholarship from the Hellenic National Foundation of Scholarships (I.K.Y.) over a number of years. I graduated in 1973 acquiring an award of excellence for mosaic head. 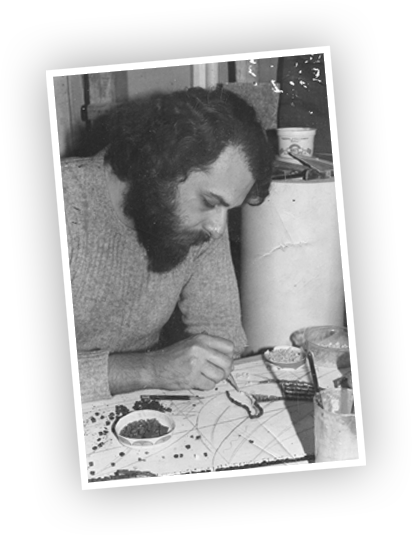 I worked next to accomplished artists in Italy and in the U.S.A. studying techniques for constructing and applying mosaic. A professional mosaic artist since 1971, I have created mosaics for 180 temples in Greece and abroad. • Church of Aghios Dimitrios (patron saint) of Thessaloniki. • Μonument for the Ecumenical Patriarch Demetrios I, at the church of Evagelistria (Volos). • Mosaics of the dome (diameter of 12 metres) of the Metropolitan Church of Panaghia Eleftherotria in Didimoticho. • The icon mosaics of the Catholicon at the Panaghia Xenia Monastery (Almyros, Magnesia). • The mosaic icons of the St. Constantinos Church in Kastoria ―next to a very few that were created by a pupil of mine. • The mosaic icons of the façade of the St. Eleftherios Church in Athens (Acharnon Street). • The mosaic icons of the façade of the Metropolitan Church of St. Demetrios in Kifissia (Athens). • Mosaics at the Holy Monastery of Kykkos (Cyprus). • Mosaics at the most imposing Orthodox Temple in Gubkin Russia. (Chosen for this work from among artists from all over the world). • Mosaics at the Holy Trinity Orthodox Church in Dallas Texas (U.S.A.). • Mosaics at the Sts. Constantine & Helen Church at Maryland (U.S.A.). • Mosaics at the St. George Orthodox Church in Frankfurt Germany. I am a member of the Chamber of Fine Arts of Greece since 1973. I was repeatedly elected as a member of the Second Tier committee for the evaluation of young artists. I am a member of the scientific association «Byzantine Culture» since 1978. The Greek Writers Association has repeatedly honoured me for my contribution to the fine arts. Since 2007 I am working with my wife, renowned icon painter Despina Klistheni-Sarfati, with whom I have created many eminent mosaics ―such as the mosaic icon paintings of the private church of St. Ioannis (property of the Kousathana family) in Mykonos.